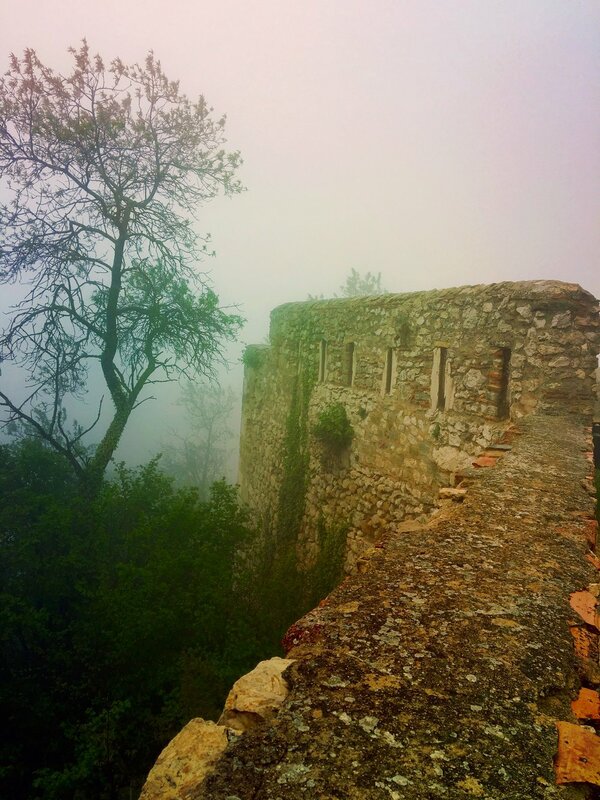 I awake with a start, somehow aware that I am in a masia in the Spanish countryside, but foggy on the details. As my eyes slide around the dimly lit room, I am hit by a sudden wave of fatigue. The kind of brought on by planes, trains and mountain roads, too many early mornings and late nights. The nape of my neck is damp; my limbs ache. I drift off again and am awakened a second time by the clinking of coffee things, the soft splatter of water from a faucet. Jill appears in the doorway. “How do you feel?” She eyes me hopefully as she sips from a mug. I know she would like to leave the masia as much as me. It has been a cold few days, the earth and sky as damp and dark as an English moor in winter. We have reveled in the atmospheric haze of the countryside but now crave the sight of new things—the aroma of food, sound of human voices. I throw off my pallet of blankets and stretch skyward. “We are going to see a castle today," I declare. And march for the shower. Refreshed by a breakfast of oranges and coffee, I pull our car onto the rugged track toward Sierra Engarceran. The fog finally lifts as we approach the outskirts of nearby Benalloch, revealing vineyards, olive fields and frothy meadows dotted with sheep. The flat landscape dives without warning into one ravine after another, finally rising into peaks as torn and ragged as paper. As we creep higher, I take the hairpin turns like an old lady and we exclaim over the nameless hill towns that roll past; each with a church like a sweet, bun-topped grandmother. 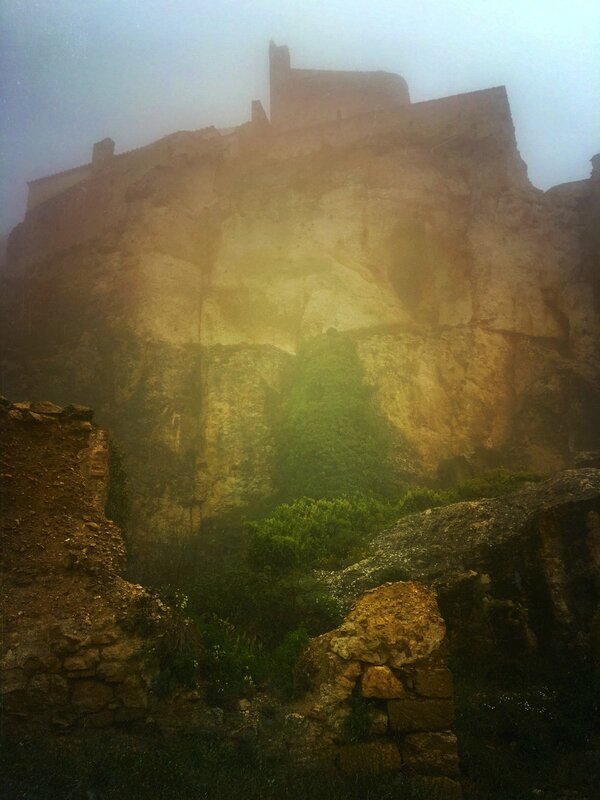 When Morella suddenly looms in front of us it as if by magic. The city is wholly vertical in nature—a colorful skirt of buildings winding up the mountainside and culminating in a first-century castle at its pinnacle. We roll silently into the citutat—the city center—where we get out, stretch, pull on weatherproof layers in the wood-fire air. The town is on the cusp of afternoon siesta, many of the restaurants preparing to close until 8 or 9 PM, when they reopen for the evening meal. Like Sierra Engarcaren, the streets are narrow, large enough only for foot traffic or bikes and lined with shops and eateries. Beneath stone arches, a fire crackles in a brazier. Drawn by its amber glow, we spy a nearby pastisseria—its large glass window showcasing neat rows of croissants, empanadas and buns. We enter and order coffees. The woman behind the counter smiles patiently as we choose lunch—ham and cheese baguettes and a trio of almond, chocolate and marmalade pastries. It is just the two of us in the café and we devour the warm, buttery sandwiches as if we will not eat again. Outside, a more serious rain begins and we watch the rhythmic blooming of umbrellas in the street. When the last crumbs of pastry have been destroyed, we reemerge to wander more twisting alleys, each leading to another level of the town until we finally reach the cathedral. We stand before its enormous doors of inlaid wood and stare up at stone faced saints who in turn, behold us with weatherbeaten, beatific countenances. 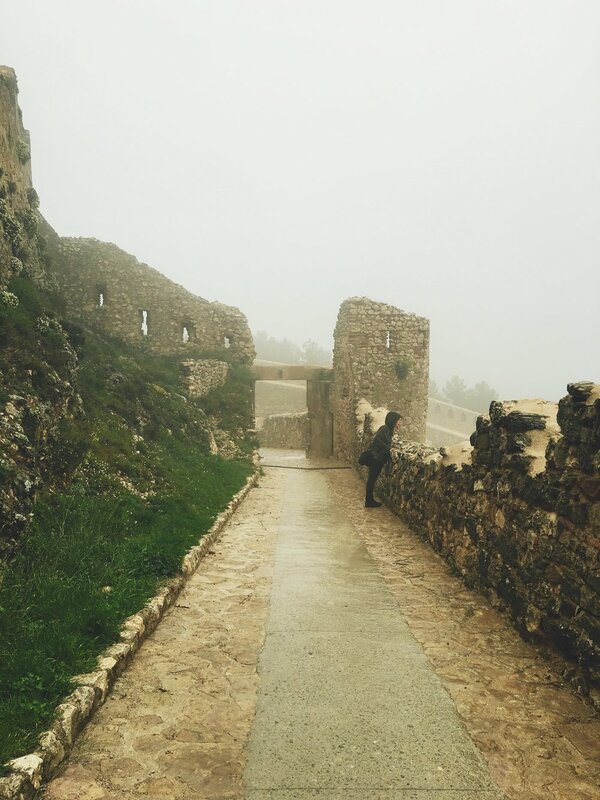 "The Castle of Morella is actually a mountain with a castle built into it. Geologically it is considered a hanging synclinal, meaning water filtered through the calcareous stone and clay have made natural caves. These caves have been in use since prehistoric ages. Due to the caves' great capacity for natural water storage, the castle could easily withstand lengthy sieges in Medieval times. According to historians, the castle has endured Roman, Muslim and Christian rule. Because of its equidistance from major hubs of civilization—Sargassa, Valence, Palma and Barcelone, it was the only castle under crown rule (neighboring territories were ruled militarily by the Knights of the Templar, Calatrava, Hospitaller, Montesa). In its early days, the legendary Spanish warrior, El Cid attempted to wrest the castle from the Iberians but was unable to take it. The castle became a National Monument in 1931 and since then, massive, ongoing restorations have been implemented." 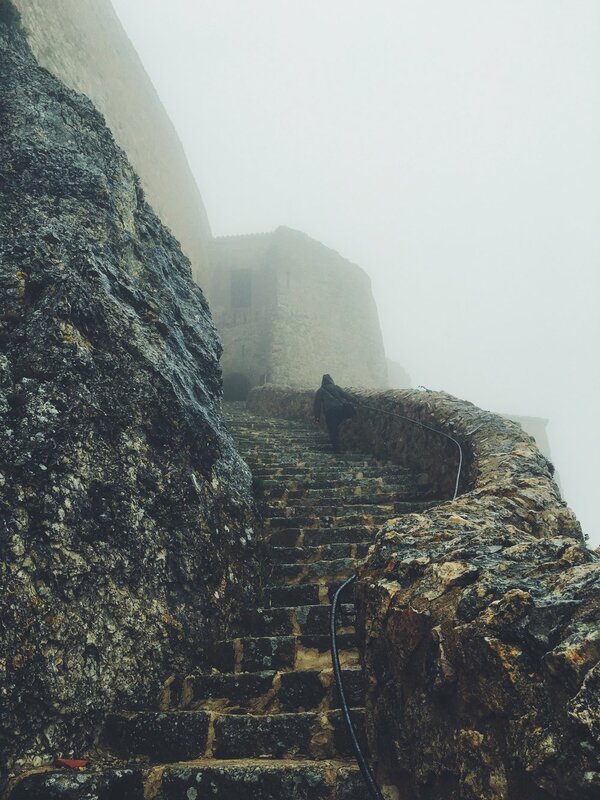 The higher we go, the more we are battered by rain and wind—unforgiving gusts that finally force us to descend the ninety-eight steps from the parade ground, all sodden skin and chattering teeth. 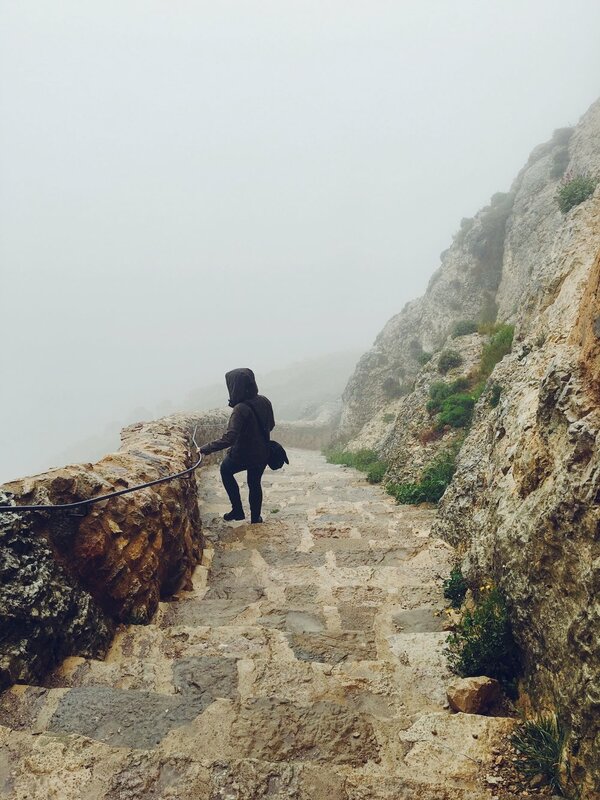 We cinch our hoods and step sideways through the gale to glimpse ruins of the castle’s ancient moat, then continue down—past the guard towers, the graveyard, stables, soldier’s quarters and artillery, the bakery, Governor’s Palace and the gigantic stone cistern. Finally, we exit through the imposing Main Gate. 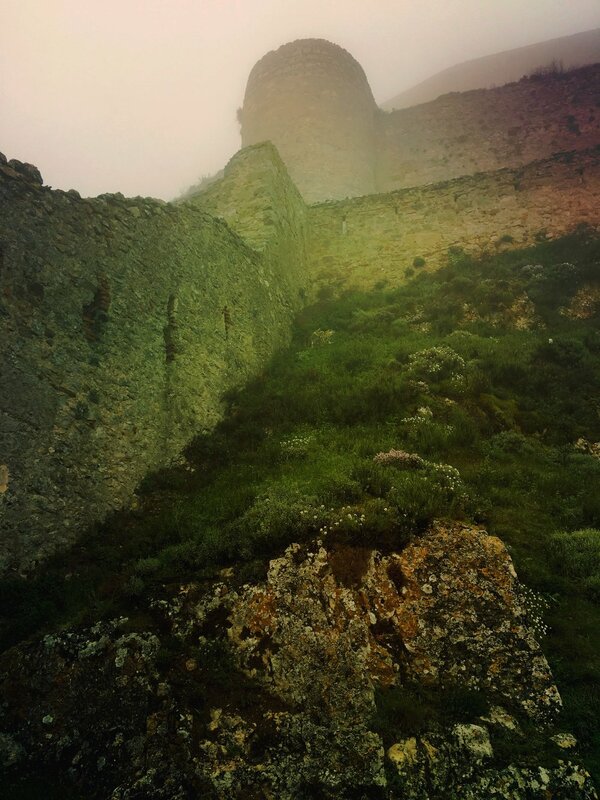 When we look up again, the fog has cleared and the massive castle—a marvel of both nature and human engineering—reveals itself. Man-made angles jut sharply from mossy, dark earth. Plant life drips from crevices beneath stone-hewn watchtowers. All along the ramparts there are ripples of grass and flowering vines. In many places, it is difficult to tell where the castle begins and the mighty mountain ends.